Wow! It's November already! And our first day of November was a great one! The weather was so fallish that we just had to get out for a bike and scooter ride and a trip to the Dairy Queen. I am joining Nicole's First Day Linkup at Journey to Josie. A post-Halloween morning, easing into the day. Chloe was needing to ease in, too. And mom needed to make a grocery list. Mmmm … some spiced pumpkin seeds. Easy to make and yummy! Making a little beef broth for swiss steak later in the evening. We are LOVING the different colored leaves! It's been an especially pretty Fall. Placing the last DQ order of this season. Our locally-owned Dairy Queen is only open from about April to November. Walking back to grandma and papa's to eat our lunch. They only live two doors down from DQ. Papa was at the lake and grandma was in Florida, so we just took advantage of their front porch. Mom needed a foot long chili dog, too. My car has been parked all week due to a dead alternator, so I've gotten more use out of my other set of wheels! Collin was a little tired from hunting. So Kyndal, Rick and I just watched some t.v. My man does dishes. Glad to have him home this weekend! Some girls like a man in a uniform... I'm for a man that does the dishes! :) Yay for you! 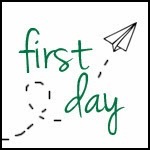 Happy First Day! I'm totally showing my husband this photo of your husband doing dishes. Right now I think he has the belief that it is physically impossible to actually load the dishwasher. ;) thanks for sharing!! Looks like a fun day!